Mainly using untapped oral histories of Italian Jews and Catholics, this book shows that Catholics in Italy who saved Jews firmly believed they were doing so in consonance with the Pope's wishes, Readers will get to know these courageous individuals through their inspiring memoirs.Yours Is a Precious Witness strives to redraw a common picture of Pius XII. He spoke loudly -- not in words that would have resulted in Nazi retaliations, but in actions that directly saved thousands of Jews, Convents, monasteries and papal buildings in Italy became havens for refugees.Pius XXII did not bow to the Nazis and Fascists. He also did not bow to the pressure of world opinion. He took the more courageous path of direct action. His example inspired Italians to respond with countless acts of individual heroism. The little-known result is that, while 67 percent of European Jews were killed, 85 percent of Italy's Jews were saved. The people who were there -- the people who knew best -- credit Pius XII for this moral victory. 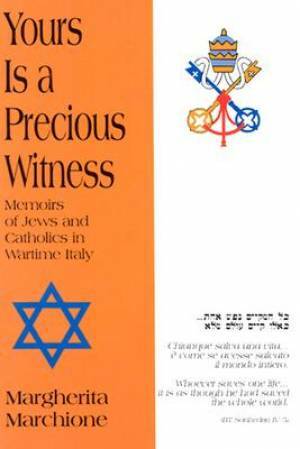 Yours is a Precious Witness by Margherita Marchione was published by Paulist Press International,U.S. in January 2001. The ISBN for Yours is a Precious Witness is 9780809140329. Be the first to review Yours is a Precious Witness! Got a question? No problem! Just click here to ask us about Yours is a Precious Witness.